Home / Arts & Culture / Boulder Jewish Goats Triple Kid You Not! Boulder Jewish Goats Triple Kid You Not! 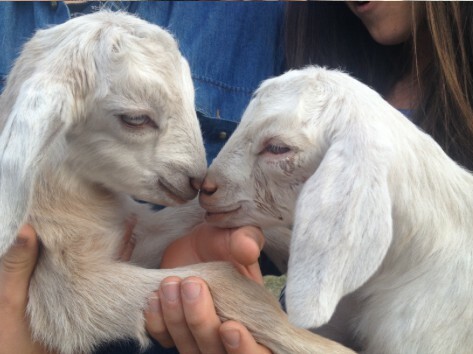 Yael Cohen ‍‍March 23, 2014 - 21 Adar II 5774	Arts & Culture Comments Off on Boulder Jewish Goats Triple Kid You Not! (Birth video links below.) Another breath-holding night in Boulder. As some of the co-op held watch inside the barn, Black Diamond’s contractions began, but no babies appeared. We grew worried. A phone call was placed to Ru Wing’s sister, a vet, who counseled her that it was time to intervene. She remained on the line to coach Ru through what suddenly became a high risk birth. After scrubbing up, Ru laid on the straw floor with an unhappy Black Diamond, apologetically reached her hand into the uterus, finally made contact with some body part (later identified as a baby’s bottom), and began to pull and pull and pull. She worried aloud if this baby was even alive. Finally the baby popped out, rump, then a leg, followed by three more legs and a head — she started to squirm on the straw, as we erupted to Ru’s joyous shout of “Oh baby! Oh sweetie! You’re alive!” Bob Wing swiftly took over, swinging her gently to ensure breathing. Within minutes, the next “bubble” appeared — another baby on the way! And then a third! Triplets!!!! Shortly thereafter, “Mom” was licking all her babies — Black Diamond is an awesome mom and is currently taking care of all three like a pro! Within a half hour, not only were those babies standing up and having their first nurse, but the firstborn, “Cruiser,” was exploring all corners of the barn. Congrats to Ru Wing for enabling a heroic birth! 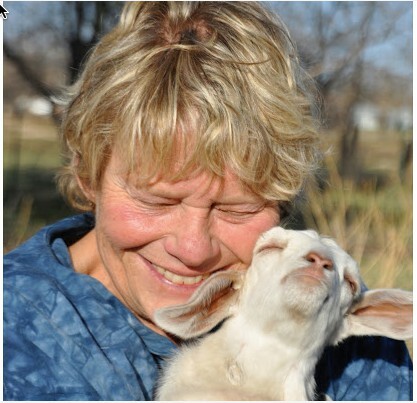 The goats and co-op membership have all voted you as “Our Heroine — 2014!” And the co-op also extends so many thanks to Bob Wing, for his calming and gentle assistance, in this exciting triplet birth. Coming soon — twins, triplets, and one more . . .
For those of you interested in possibly joining the co-op, we currently have a few open evening shifts which entail playing with the babies, taking care of feed, water, and clean up for the goats, and within a few weeks, MILKING! Co-op members take home what they milk themselves (on-the-job training available) for drinking and/or cheesemaking. Apply by emailing to bait-izim@googlegroups.com or by speaking with a co-op member. To view the births on youtube, click on this link: http://youtu.be/l9Hrp0hepmY. If for some reason it doesn’t work, copy and paste the link into your browser. (Warning to parents; as beautiful as this is, it is also a bit bloody. You might want to view it first before sharing with your own kids.) These births were captured on video by co-op family member Neil Simon.